I close my eyes and think back to the days when I used to stuff my face with mum’s spaghetti bolognese and I loved it, tomato juice dripping all down my chin. Shez is passionate about strawberry starbursts, her mum’s cooking and her boyfriend’s prickly face. But when her life seems to slip out of control, she finds herself choosing between the food she loves and the people she cares about, never suspecting that this will become a matter of life and death. Strawberry Starburst is a heartfelt and poignant new drama about one girl’s battle with her demons…and the lengths she’ll go to fight them. 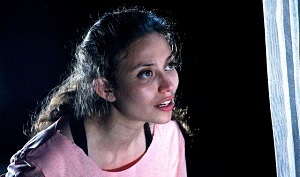 "The playwright Bram Davidovich has taken extraordinary steps to carry out extensive research into the characters of this play [and] put the utmost effort into ensuring the extreme, raw, emotional rollercoaster of experiencing Anorexia Nervosa is portrayed"
Recommended for ages 14+ as there is strong content. Contact the theatre on 02077010100 if you would like further details. There will be a post show discussion on Friday, 20th May.